Customer based pricing will allow for customers of specific customer types to see different prices on your store front. This is great for the usual wholesale and retail customer types. 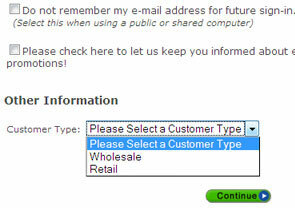 Enter the Customer Type (for example Wholesale), and click on save. Repeat the process for as many customer types as you want. From this screen, you can choose to edit an existing custom field, or click on the button in the top, right corner to create a new one. For this demonstration, we have chosen to create a new custom field. 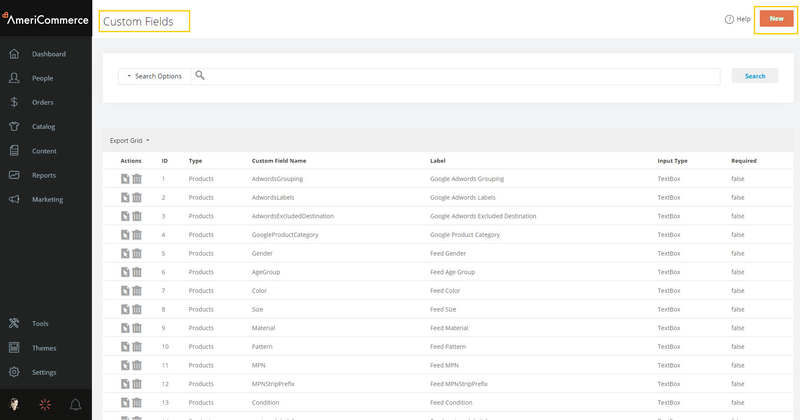 Searchable: Adds the field to the search filters on particular admin pages. Does not affect frontend search. Default Checkbox sets whether this field is required. Populate these fields and press save in the top right. You can now add additional list items. Click on the Save button at the top right corner. Under the section Alert Email Subject there is a checkbox to the right below the label Send. Enable that checkbox. Now every time a user registers an email copy will be send to the store admin. Don't forget to save. In order to avoid any confusion about customers seeing different prices before and after they log in you should make sure they log in before they can see prices. To do this navigate to Settings >Security and click on the General tab. There is an option called Require Login For Pricing; enable the checkbox and click on the Save button. Open any product in the Product Editor and click on the Pricing tab in the editor. For the next step, click on the New Price button. Next, an overlay will open up that presents a set of options like displayed below. Under the section Select Pricing Options enable Store (only required if you are running multiple stores; if you are running only 1 store then do not check this box) and Customer checkboxes. Wait for the page to refresh and click on the PriceMatrix button next to New Row. Store: Click on the blank entry under Store and select the store (if you are running multiple stores) or leave it at (-All-) to apply this pricing to all your stores. 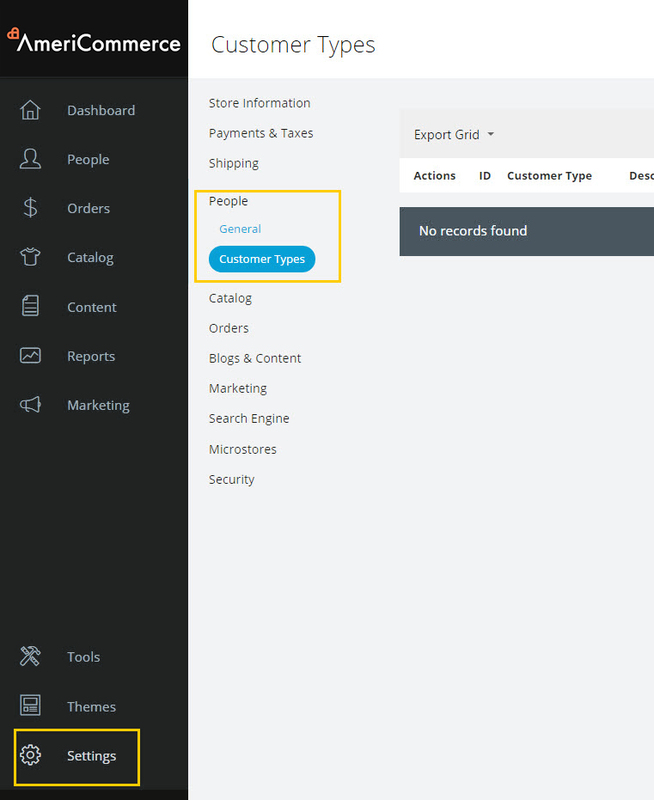 Customer Type: Click on the blank entry and select the customer type from the drop down list. Starting Quantity: leave it at 1. Cost: Enter how much the product costs you, if you know the value, or leave it at 0. Price: Enter the price of this product for this customer type. 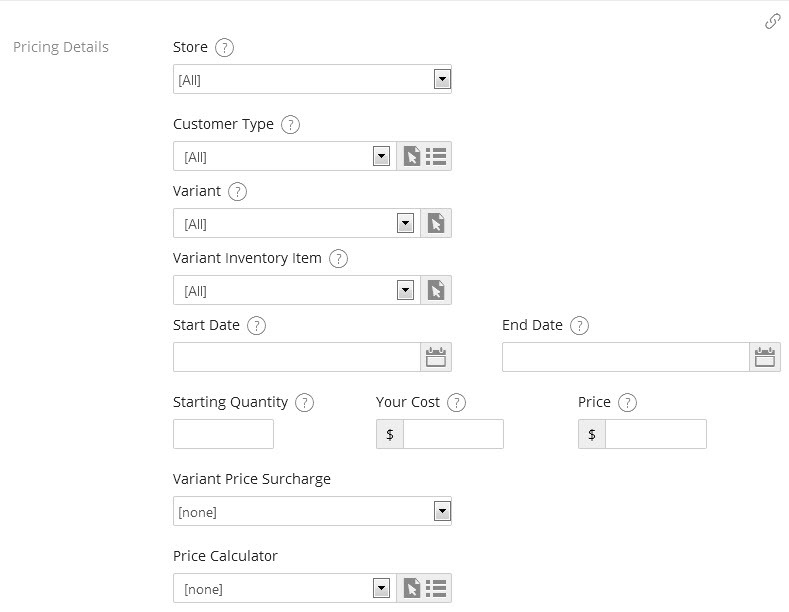 Click on PriceMatrix to add another row and repeat the process for the other customer type(s). Click on Save to save settings for this product. Browse to Tools > Data Export Tools > Product Pricing Export and Get Products for All Categories. Click on next and click the Export link. You will download a CSV file. Open it in MS Excel or other spreadsheet software. Select the Browse icon next to Import File and locate your spreadsheet. Select Upload, then click "Load" next to your file in the file listings. A mapping page will appear and this is where you can make changes to the default spreadsheet headers based on your needs. Select and make sure there are no errors. Make sure to use the Validate Data link before you upload any data (here or for any other purpose). Validation catches common errors and saves the hassle of having to correct mistakes. It is recommended that you first try uploading the pricing data for 5-10 products to make sure you have got the import step right. Once you are done, your store(s) will be ready to show customer specific pricing to all visitors.